This game is an ideal gift to your loving kids in all cities in India. It consists of 1 game board. 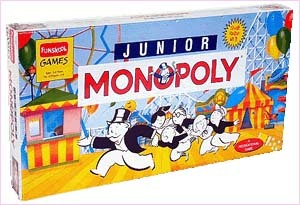 1 pack of 24 chance cards, 48 plastic ticket booths (4 sets of 12), 1 pack of Monopoly money, 1 die, 4 car playing pieces. To be the player with the most money when another players runs out of each! To do this, set up ticket booths on as many fun fair Amusements as possible and collect entrance fees as your friends go past. Amaze your kids with such exciting Gifts across India through GiftsAcrossIndia.com. Shipping Info : Ships within 3 - 4 Working Days.